The government body, the Education and Skills Funding Agency (ESFA) are currently working on the Digital First Careers Service to meet the many needs of citizens making the next (or first) step in their careers. I joined the multi-disciplinary team, for a 6 month contract, fulfilling the role of Interaction Designer, translating user research findings into digital solutions. I produced wireframes, documentation, and coded prototypes, adhering to the digital service standard, set out by the Government Digital Service. I ran a number of kick-off meetings and workshops to gather the existing knowledge into a form that could be utilized to push the project forward. The workshops were used to decide on the personas to focus on for MVP, and outline 'happy-path' user journeys. The outcomes of this work allowed the team to create a clear user research plan, by highlighting which assumptions and design patterns needed further validating. While testing with users we noticed that almost all expected the service to act like a job site, where a search would return job adverts and a way for them to apply. Further research highlighted a need that users themselves were not conscious of. Their 'hunt for a job' needed to be disrupted, so that they would instead learn about, and take useful steps towards a chosen career. The challenge was to find a way to change user expectations when entering the service and communicate its purpose. With this insight we were able to create content throughout the service which contextualised and reinforced its purpose. Some of our users had a job title in mind, some had an idea of what area of work they were interested in and others needed to be inspired. For those with a specific role or career area in mind, we set the constraints and defined the search engine behaviour in a way that was useful and intuitive. For the users that had a looser idea of what they wanted, we created a browse experience which grouped jobs into categories. We created, tested and validated these categories through different rounds and types of user testing including card sorting and tree tests. The results enabled users to progress from a broad subject area to a specific role, and find inspiration in related careers. We also defined the team's approach to creating and maintaining categories over time, so the experience would improve as more careers were added and more research carried out. Through the process of design exploration, taking into consideration the user needs and technical challenges, I was able to produce user stories for the product backlog to guide future iterations. Here I proposed a journey which helps the user move from a job they are interested in, through to more specific details, based on the next step which best suits them (apprenticeships, education, volunteering, etc). At the end of the journey they are presented with the information required when using specific external tools. As a designer working on a government service you have a library of design patterns to draw from. This ensures consistency across government services and builds on top of the research carried out by GDS. Sometimes these patterns need to be adapted when a strong user need arises. 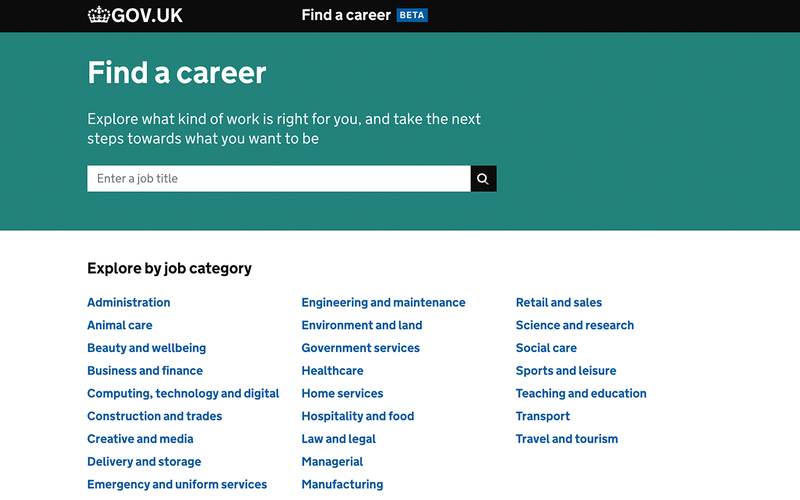 For the Digital First Careers Service I explored the suggested navigation pattern, breadcrumbs, and highlighted the potential problems for the service. These were documented in the backlog with potential design solutions. During the Alpha stage a larger service, comprising of a number of products had been explored. When moving into Beta the stakeholders were still under the impression that this whole service would be delivered. The team were in fact following lean principles and therefore producing the product that was most important to the user, first. Through running a number of workshops, where the whole team were asked to 'think as a Product Owner', a product and content strategy was produced, which gave the team a foundation and shared understanding of what they were working on. This in turn shed light on the wider service strategy, highlighting user needs that would not be met with the product. This gave the Product Owner the context and language required to convince the stakeholder to create new teams, who would produce the other products required to reflect the larger service vision.